In Downeast Maine a partnership has developed between Project SHARE, an organization with a mission to restore Atlantic salmon habitat in Downeast Maine, and Moosehorn National Wildlife Refuge. In 2012, SHARE was asked to lend their expertise in the removal of five impoundments in Moosehorn NWR. Staff and equipment was provided from Moosehorn NWR to the project management of Steve Koenig, SHARE’s Executive Director, in order to complete the removal of the impoundments and decommission earthen dams. Upon completion of the project Bill Kolodnicki, Refuge Manager, was asked if he would be willing to collaborate on projects outside of the refuge in the future. He answered with an enthusiastic “YES”. In 2014, Moosehorn and Aroostook NWRs provided staff (Mike Krug, Brandon Harriman and Kirk Cote) and heavy equipment to help Project SHARE on two open- bottom arch culvert installations and culvert removals at four other sites in SHARE’s restoration focus areas in the Narraguagus and East Machias Watersheds. Scott Craig and Serena Doose from the USFWS Maine Fishery Resources Office (MEFRO) provided on-site project management and funding was provided by NOAA, USFWS, and landowner contributions. Students from the University of Maine Machias assisted with post- construction monitoring and erosion control at the East Machias arch culvert site. 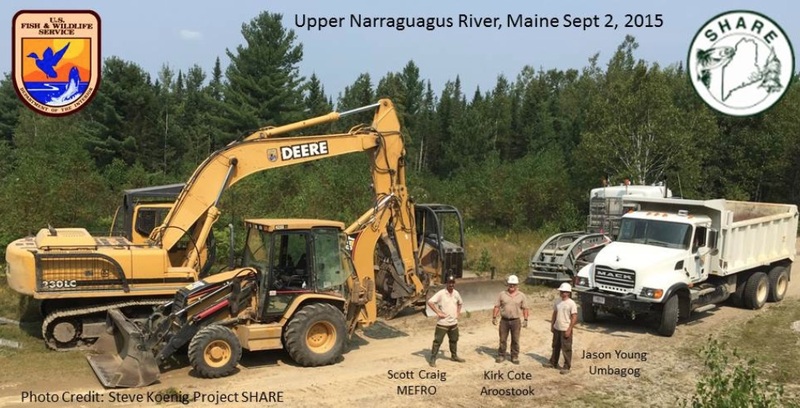 In 2015, Project SHARE, USFWS-MEFRO, and Moosehorn NWR will once again work together on six to eight habitat connectivity projects in the Narraguagus and East Machias Watersheds.